Lawrence MacAulay, Canada's 69-year-old Minister of Agriculture and Agri-Food echoed the tired stereotype sexist attitude by saying, "I intend to listen to the man that does the work -- the farmer." Just as we have an expectation for true gender equality, "because it's 2015," it is fundamentally important that Canada's Minister of Agriculture have a broadly contemporary perspective. When Prime Minister Trudeau was asked why a gender balance in Canada's cabinet was so important, his quick reply, "because it's 2015," was delivered with a confident shrug celebrated around the world. Days later, one of Trudeau's new cabinet ministers upset that balance and preserved the old patriarchal social structure with a sexist remark in his very first interview after taking on his new portfolio. Lawrence MacAulay, Canada's 69-year-old Minister of Agriculture and Agri-Food echoed the tired stereotype sexist attitude by saying, "I intend to listen to the man that does the work -- the farmer." Gender balance is not enough when it doesn't foster gender equality. This is an opportunity for Prime Minister Trudeau to show us his feminist sensibilities in action. Famously, he once posted to twitter: "I am a feminist. I'm proud to be a feminist." As a feminist, Trudeau should take this opportunity to kindly correct the language of his Minister and educate him about the responsibility of eliminating these stereotypes of socially appropriate gender roles, not endorsing them. Ignoring the misspeaking of a Minister gives a green light to the false prejudicial notion of one gender as being superior than another gender in a particular domain, such as farming. Unsurprisingly, the last census showed that there is an increasing percentage of farm operators in Canada who are female. Guaranteed, the return of the long-form census will confirm that female farmers are on the rise on Canada, growing still from the last recorded number of 27.5 per cent of farmers. Minister MacAulay might be more warmly welcomed to the job if he makes the effort to correct his misconception about who a farmer is. Trudeau should help him with this. In fact, the relationship between MacAulay and Trudeau is vastly interesting, with MacAulay being one of the first to back Trudeau's leadership bid. MacAulay has represented his P.E.I. 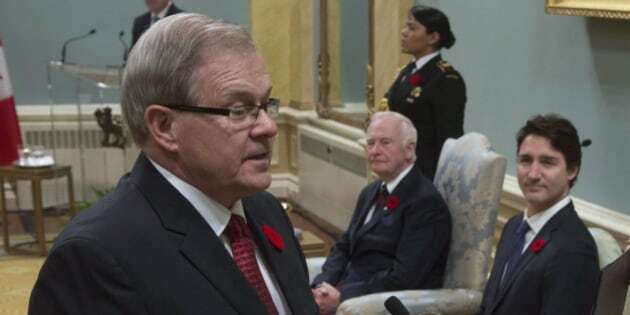 riding for the past 27 years but in the final two years of the Chrétien Government, he had to resign from cabinet in disgrace over allegations of party patronage and untendered contracts to family and friends. He closed his resignation letter by threatening to sue "those who have publicly slandered my reputation" -- but instead he was branded as ethically-challenged by the opposition. Last year, MacAulay's long-time anti-abortion stance was overruled by Trudeau, as good evidence that Trudeau has command of his caucus and therefore the leadership needed to carry him to the Prime Minister's office. This offers hope that he can help guide his more questionable cabinet choices now. MacAulay had tried to argue that he is "grandfathered" to be able to vote pro-life, as he has always done. I'm not sure what sort of alternate Parliament such a vote could even arise, but in the end MacAulay had to concede on twitter that: "I accept and understand the party position regarding a woman's right to choose. Despite my personal beliefs." Adding later in interviews that the change has been "very difficult" for him. And: "it hurts." Just as we have an expectation for true gender equality, "because it's 2015," it is fundamentally important that Canada's Minister of Agriculture have a broadly contemporary perspective. The treatment of farmed animals in Canada is also very much radar of average citizens who have concerns about animal welfare, as well as the environmental, labour, and health issues associated with animal agriculture. Within MacAulay's new portfolio are departments that for too long have been allowed to run amuck and are desperate for real change. With a couple exceptions, the federal government only monitors farmed animals in transport and at slaughter -- and they do a remarkably horrible job in both of these situations. Occurrences such as the CFIA's participation in appalling cruelty in animal transport and their inability to enforce even Canada's archaic animal protection laws require a minister with vision and modern sensibilities. MacAulay stood behind Trudeau's left shoulder during his first statement as Canada's new Prime Minister, proudly proclaiming that "Government by cabinet is back" and that this is "a cabinet that looks like Canada." But when it comes to gender equality, maybe looks alone are not enough. Let's hope this cabinet can act like Canada too.